Today we basically waited for cold front to hit. We have free wifi using our booster. Dave spent most of the day trying to update our Navionics charts on the computer. With this connection, it would get within 10% of being finished and stop. So it took several attempts that were about 2 hours each, but it finally worked. 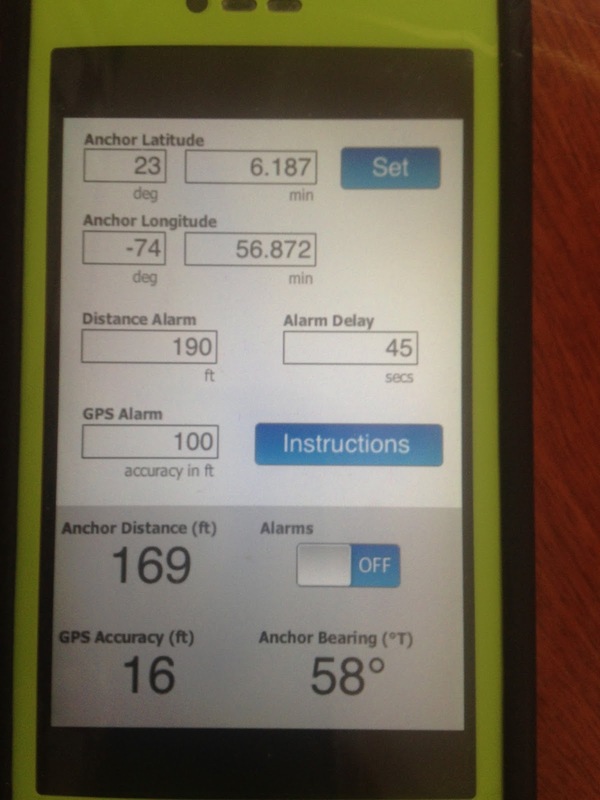 Or it could be the Navionics application that we are using. It’s happened before. He wasn’t a happy camper most of the day. We were glad we weren’t paying for the data, since it had to be restarted several times. About 3:00, I decided to sit outside for awhile. It looked to me like our anchor had drug about 20 feet. It may have just been the way our boat had swung. Or the chain may have straightened out. I told Dave I would sleep better tonight if we went out to check the anchor. We had to take the dinghy off the davits and put it back in the water. After following the chain out to the anchor, it looked good. Dave set an anchor alarm on his phone. He has an app called Drag Queen that Active Captain developed. We don’t use it routinely, only when we are expecting strong winds. The app has to be active all night. That means it can drain the battery of the phone unless you keep it plugged in. And that uses the house battery, which isn’t being replenished by the solar panels at night. Hence, we don’t use it all the time. The cold front hit about about 4:00 pm and picked up before we went to bed. We are experiencing gale force winds. And we're predicted to have winds in the 20’s through Wednesday. Not going anywhere soon. The motion of the boat with the wind on our nose is easier to take than when it hits the side of the boat. So sleeping should be OK.